US ULCC Spirit Airlines has not escaped the effects of pricing pressure in the US domestic market during 2015, and recently cited soft pricing as a main driver in its second downward revision to forecasted operating margins for the year. As its guides to lower operating margins – still in the healthy 21.5% to 23% range – Spirit is working to reiterate the strength of its business model that entails stimulating price sensitive travellers. The airline maintains that it transports passengers that would not otherwise travel by air, but Spirit’s competitors have recently cited progress in gaining some market share lost to ULCCs. Spirit remains confident that its strategy of bottom feeding in large markets with high fares will continue to reap rewards in the form of solid profitability. But as the current domestic environment shows, even the lowest fare producers are not immune from pressure when fuel costs reach certain levels. Spirit in Jul-2015 refined its projected operating margin for 2015 to 21.5% to 23%, down from an original target of 24% to 29%. After 2Q2015 Spirit trimmed its margin targets to 24% to 27%. The second revision was driven by a change in Spirit’s conclusion that pricing pressure in peak periods would stabilise, but the airline explained in early Jun-2015 the domestic pricing environment softened further. Spirit posted a 14.8% decline in operating revenue per ASM during 2Q2015, and its average ticketed revenue per flight segment fell 19.4% to USD68.35. Its yields sank 13.3%. The airline attributed 40% of the decline in operating unit revenue to the ramp up of new markets, 40% to pricing pressure in many markets and the remainder specifically to pricing pressure in Dallas. For the week of 27-Jul-2015 to 2-Aug-2015 Dallas Forth Worth is Spirit’s fourth largest base measured by ASMs and third largest tracked by frequencies. The Dallas market, which comprises Dallas Fort Worth and Dallas Love Field – has been the largest domestic market to endure pricing pressure driven by Southwest’s expansion at Love Field after the lifting of the Wright Amendment in late 2015. 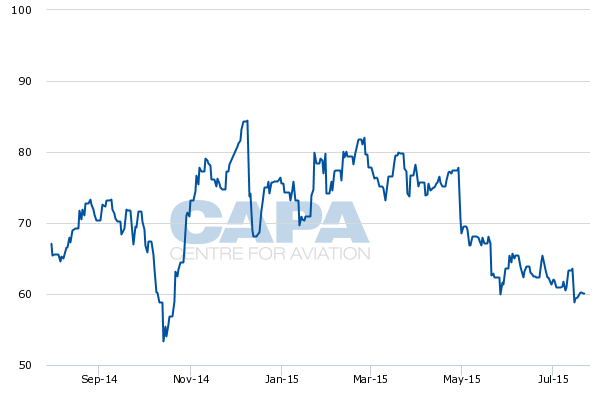 Southwest’s push from Love has triggered major pricing dilution in the market. Spirit’s average non-ticket revenue per flight segment dropped 1.7% from USD55.14 to USD54.24, but Spirit’s ancillary revenue performance remains one of the strongest in the US industry. One of the drivers of Spirit’s decline in non-ticket revenue per flight segment was lower bag fee revenue per flight segment, driven in part by pricing action in Dallas. Southwest does not charge for checked luggage, so if the price point is negligent and customers can avoid bag fees, there will be some passenger spill over to Southwest. Further stressing the small overall effect of a slight drop in bag fee collection, Spirit CFO Ted Christie highlighted that Spirit has outsourced its onboard catering to a third party vendor under a revenue share agreement. He estimated that agreement moves the non ticket revenue per passenger lower by about USD1. Spirit continually stresses that its business strategy is not based on growing market share. The premise is “not to be 50% of anywhere in America”, Mr Baldanza concluded. He reasoned that having a presence in larger markets such as Chicago or Dallas does not make Spirit a meaningful market share player in any one place. A look at ASM distribution at five of Spirit’s top bases reflects that strategy. 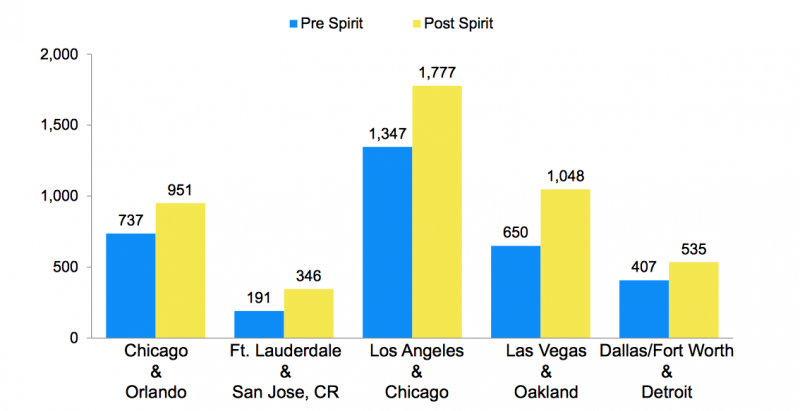 Spirit has less than 10% of the ASMs at Las Vegas, Chicago O’Hare, Dallas and Detroit. It is the second largest airline in its headquarters Fort Lauderdale, with an 18% share. Mr Baldanza also maintains that the basic premise of Spirit serving customers that would not otherwise travel by air remains in full force. He highlighted Spirit’s calculations that an increase of local passengers in markets where Spirit has launched service is closely correlated to the amount of capacity Spirit has added in those markets. “What we are doing is carrying the small amount of traffic that their [the larger US airlines] revenue management systems don’t want and that fills our airplane,” Mr Baldanza concluded. Notes: Measurement period begins January 2007 through June 2014. System average measures only those markets Spirit has served for at least twelve months. Sample markets do not necessarily reflect system average. Pre Spirit is the average for the four calendar quarters prior to Spirit’s entry; Post Spirit is the average for the four calendar quarters following Spirit’s entry. But Spirit’s rivals counter that logic. 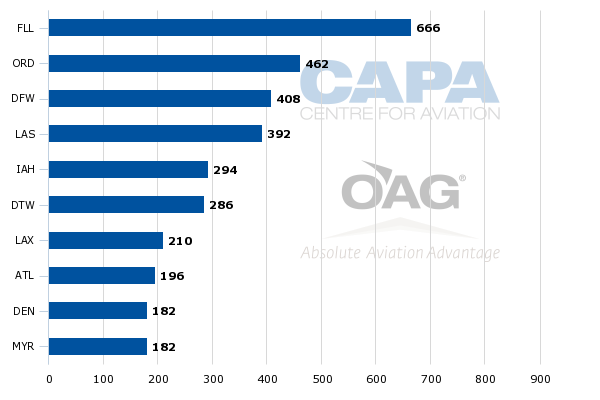 American at the start of 2015 cited pressure from Southwest and pricing challenges from ULCCs in some of its markets. It opted to match that pricing, and as a result, said it has won back some market share lost to those airlines by not being price competitive. 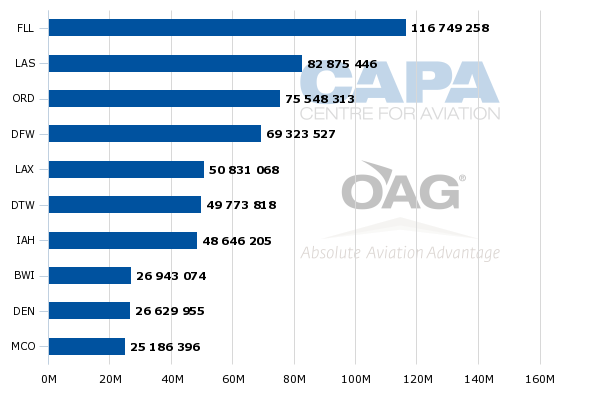 American also has a hub in Spirit’s third largest base measured by ASMs, Chicago O’Hare. Delta, which is the largest airline in Spirit’s sixth largest base Detroit, has added a stripped down Basic Economy fare to compete with Spirit. Although Spirit is feeling the pricing pressure in Dallas, its estimates that 40% of the drop in 2Q2015 operating revenue per ASM show that the airline is encountering diluted pricing in many other markets in its network. Most US airlines are refraining from offering a timeline of when unit revenues will reach flat levels year-on-year or return to positive growth. Spirit’s capacity in 2016 will drop to 20% to 22% growth after a 30% increase in 2015. Mr Baldanza remarked that Spirit will add roughly 20 new markets in 2016, which would result in similar growth levels for 2013. Spirit has not offered unit revenue guidance for 2016, but Mr Baldanza highlighted the airline was doing well in the current revenue challenged environment. Characterising Spirit as as high growth, low cost discretionary travel based airline, Mr Baldanza stated the the company prefers investors measure its performance using growth in earnings, earnings per share and margin performance. In those metrics Spirit delivers, increasing 2Q2015 profits on a GAAP basis 18% to USD77 million. Its pretax margin was flat year-on-year at 21.3%. Even as it plans 15% to 20% capacity growth for the short to medium term, Spirit is forecasted to only represent 1.8% of US domestic ASMs by YE2015. Unlike it mature large US network rivals, Spirit is a growth company, and aims to use its favourable unit cost structure to stimulate traffic. 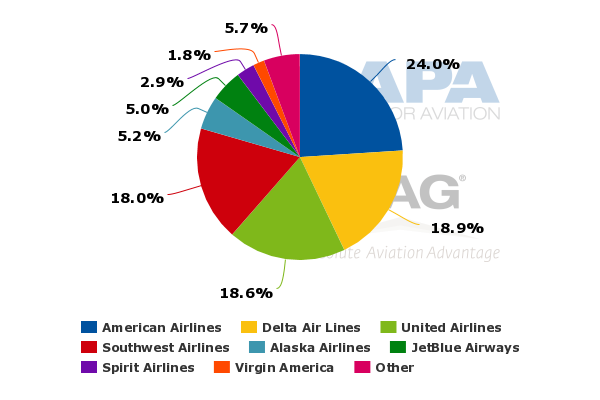 But Spirit’s rivals are not ignoring the airline’s expansion into their hub markets – five of Spirit’s top bases are major hubs for US network airlines. This is very much an airline that punches above its weght. In the current fuel environment, US majors have the luxury of matching Spirit’s fares on the specific flights Spirit operates from their hubs. The large network airlines are also working to improve their cost structures, which could result in an ability to continue to match Spirit’s fares for the foreseeable future, especially if fuel costs remain at current levels. Spirit has a valid argument that its financial performance in many important metrics remains strong and its growth profile and business strategy are different from other US airlines. But even low fare airlines are being swept away in softening US domestic pricing that shows no signs of waning substantially in 2015. Spirit remains bullish on it ability to weather the current environment. Now, given Spirit’s dip in share price, jittery investors may need a bit more assurance.